Listed below are some links that may be useful to your membership. If you have a link that you think may also be useful to the Yorkshire Ridings Membership please contact the Area Coordinator for approval. National MX-5 Owners Club The National Club that Yorkshire Ridings is an Area of. Photo Website Where our members photos are uploaded so we have a great record of all our runs and events. Facebook Group The Yorkshire Ridings Area Facebook account run by the AC. 4b Eden Place, Outgang Lane, Dinnington S25 3QY. 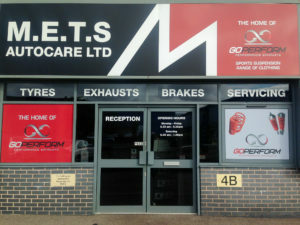 General servicing, tyres and home of GoPerform exhaust systems. Steel City MX-5 is a Sheffield family run business specialising in Mazda MK1 used quality parts. All our Parts are removed carefully from fully running MX-5 models 89-98. From 1.6 manuals / Automatics UK or Eunos to 1.8 spec models. With all the parts already removed and ready to ship, we can offer a next day tracked service on all UK mainland orders placed before 3pm. We also offer Worldwide shipping using our very carefully selected couriers. MX5 City was founded in 2001 and is dedicated to providing you with the best quality MX-5 cars for sale. Our stock is updated regularly, sourced both here and from abroad and you can see these on our stock pages. As well as car sales, we have a huge stock of new and used spare parts and accessories for all model MX-5’s, available both online and in our Doncaster shop. We have been specialising exclusively in Mazda MX-5’s since 2001. Our fully equipped workshop and body-shop is staffed by highly trained, enthusiastic technicians. We can cater for any job from a simple service or new hood fitting to a full-blown restoration. ChrisRS Valeting. 20% discount to club members. Contact Chris for a quotation. Now includes a new, totally FREE Car Deodorisation service at CRS V&D on Bronze, Silver and Gold Packages"Car Cleaning with a Passion and an Attention to Detail"
MX5 parts.co.uk Online parts company that also attends the Spring and National Rallies. Mazda on Track Track Day Company. MOT Trackdays has been an established track day operator for many years offering safe, friendly and great value track days / circuit days at many of the UK’s iconic race circuits and test tracks. Click here to see our race track day circuits. Whilst our roots are in the MX-5 community we welcome all marques to our track days and are also proud to offer exclusive days to clubs by arrangement. Click here to see our current list of track days and make a booking. Or contact us if you have a query. Javelin Trackdays Track Day Company. Road Runner Racing MX-5 based kitcars. CBS Auto’s Mazda Specialist’s “If a job is worth doing, it’s worth doing right!” Unit 18, Ecroyd Street, Nelson, Lancashire BB9 7BJ Tel: 01282 697413 timing belts, welding work, body work, servicing, clutches, tyres and exhaust systems. Working on Mazda’s for over 10 years.